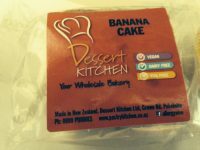 Hardly a promising name for a food blog post! I was scared about what we might receive for our meals but I was actually pleasantly surprised. Not haute cuisine obviously, but not dire either. They were all pretty good. 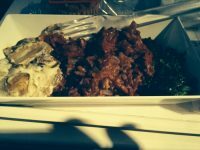 We ate three meals on our recent flight to the USA: rice, lima beans and roasted vegetables, a nut cheese and spinach lasagna, and a spicy rice with creamy mushrooms. They came with a vegan cake and fruit or a salad. We got soy milk for the coffee on the Australia to New Zealand leg but not on the longer leg of the flight. Thanks Air New Zealand for making a decent effort and actually understanding what vegan food is! 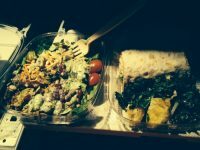 On our leg from San Francisco to NY we bought our own food at the airport – a vegan salad and a roasted red pepper hummus wrap. Both were marked as vegan and they were delicious. We combined them with some leftover kale, orange and almond salad from lunch at Gracias Madre and made a delicious meal. 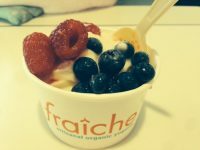 Before we left the airport we managed to devour a frozen soy yoghurt with berries. So no need for despair at vegan airport food either. We didn’t even need to raid our emergency snack rations. I like the title because I am a real stickybeak when it comes to airline food. Sounds like you did pretty well there and I love that there’s vegan cake! Wow! 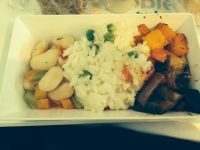 That’s way better than the vegetarian meals we got on Malaysian Airlines back in 2007 (I haven’t done an international flight since I’ve been vegan). Ours was all unidentifiable food in a stodgy white sauce. Yours looks like real food. Hope you’re having fun! My boyfriend and I were talking about airline food just yesterday! 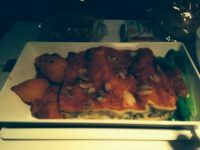 I’m impressed by the nut cheese lasagne – that’s next level for plane food!